We were out of Reece's Peanut Butter Eggs. I KNOW! I was faced with a dilemma: dare I go without or brave the nasty rain that looked like it could turn to snow at any minute? I decided would forge ahead into the wild wet yonder and tell myself that the peanut butter eggs were my reward for ruining a perfectly good hairdo. I can justify just about anything. Just sayin'. 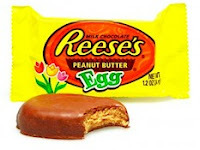 When I got to the Wal-Marts, I realized that I could not just set down a package of Reece's Peanut Butter Eggs on the conveyor belt all by it's little lonesome. It would garner too many raised eyebrows and looks of derision from my fellow shoppers. Not to mention the dripping smirky-ness from the checkout lady. I may have a bit of a problem with what other people think. At any rate . . . I took the only action possible: I threw down a loaf of bread and a gallon of milk and I went from being the object of abject curiosity to just being a good mom. I think I may be getting a handle on this Wal-Mart Mom thing. And that's what I learned today. 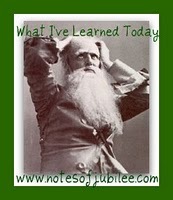 What have you learned today? You are an incredible mom! Mine don't get any Easter goodies until the day itself!